Here’s a video to share with your friends for Asexual Awareness Week! Need a “Totally Ace!” bumper sticker? We have one of those! 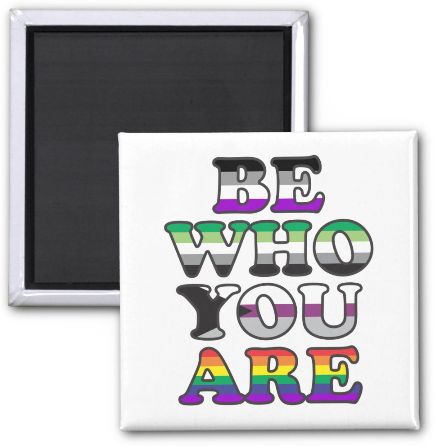 How about a magnet that lets people know it’s okay to “Be Who You Are“? 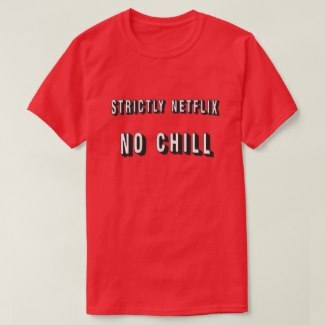 Or maybe you need a shirt that proclaims you’re “Strictly Netflix, No Chill“? Those items and more can be found here! 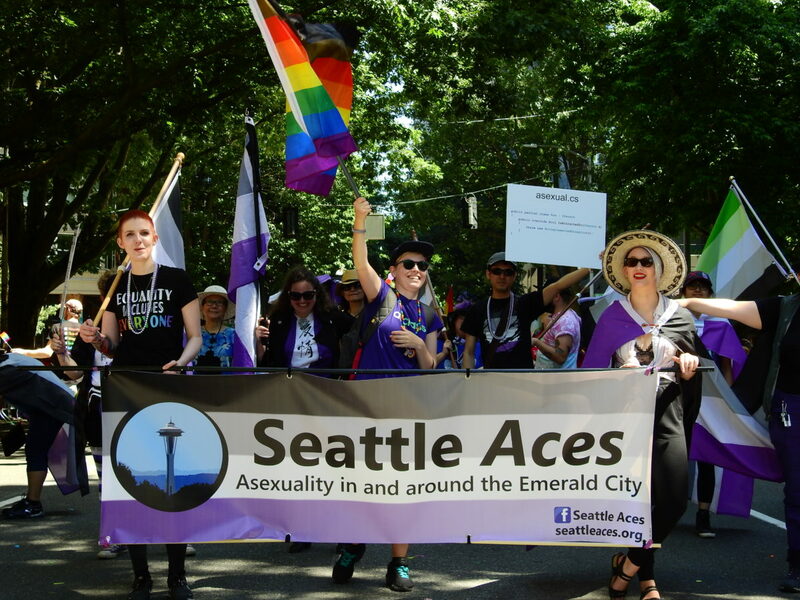 Author seattleaceadminPosted on August 16, 2018 Categories UncategorizedTags ace pride, fundraising, visibilityLeave a comment on Seattle Aces Store! 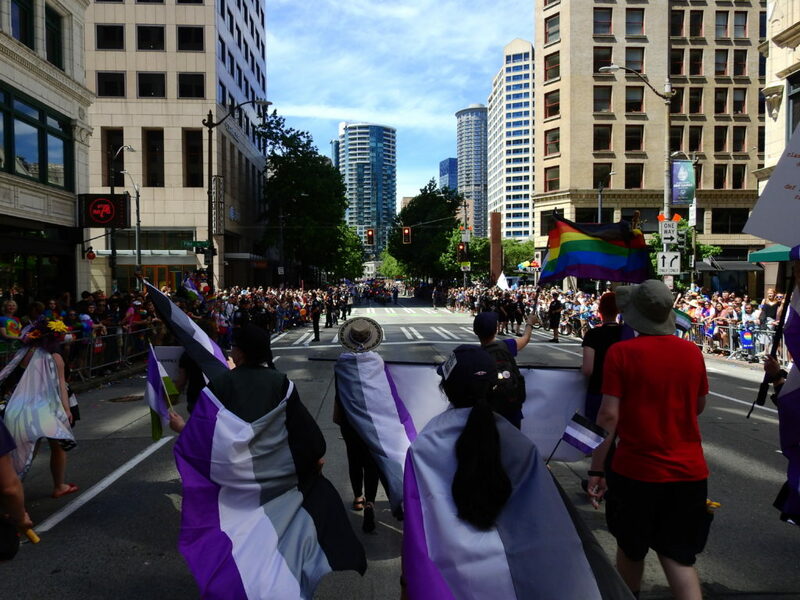 The parade is on Sunday, June 24th, 2018, and runs through downtown along the mostly flat 4th Ave, from just south of Westlake Center up to Seattle Center. 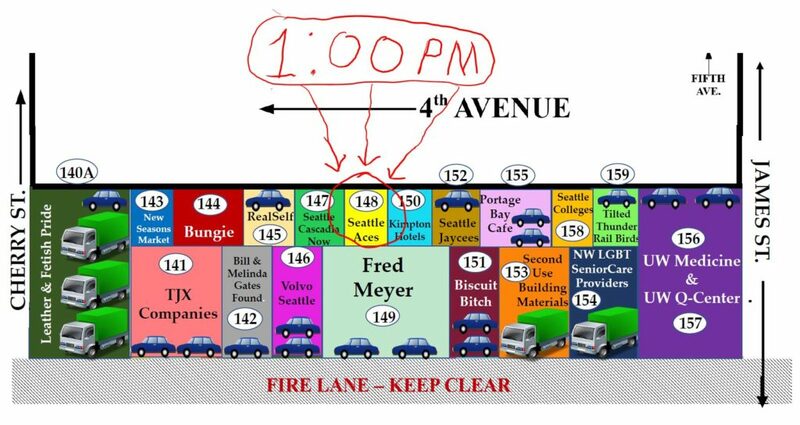 We are contingent #148, and our staging area is located about halfway between Cherry and James along 4th Ave, below City Hall. We are located between the Cascadia Now and Kimpton Hotels groups and are next to the Fred Meyer Group. Our staging time starts at 1:00 PM. RSVP on Facebook or Meetup, or stay tuned here for more details. 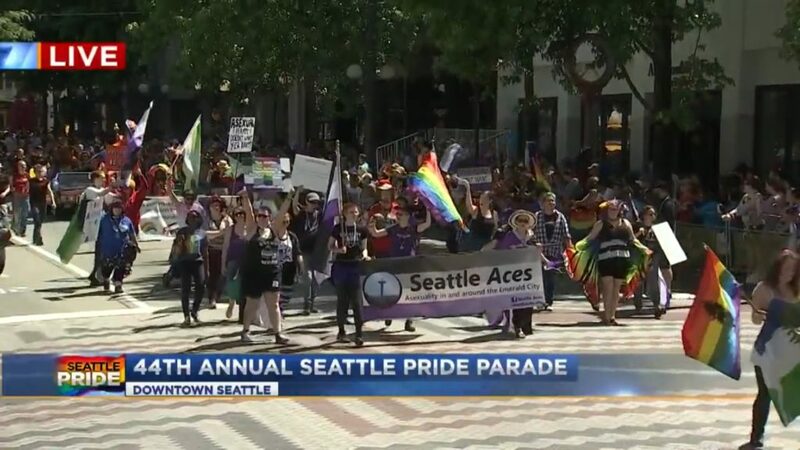 Author seattleaceadminPosted on March 25, 2018 June 16, 2018 Categories UncategorizedTags ace pride, pride parade, seattle prideLeave a comment on Marching in Seattle Pride 2018! These are notes from the Seattle and Surrounding Aces Discussion Group meeting of July 9th, 2016. These are notes about what we talked about, relevant links, and other information about discussion topics. This is not meant to be a transcript and is not necessarily even meant to be a coherent recounting of the discussion. We started the meeting by discussing a possible screening of the documentary (A)sexual. 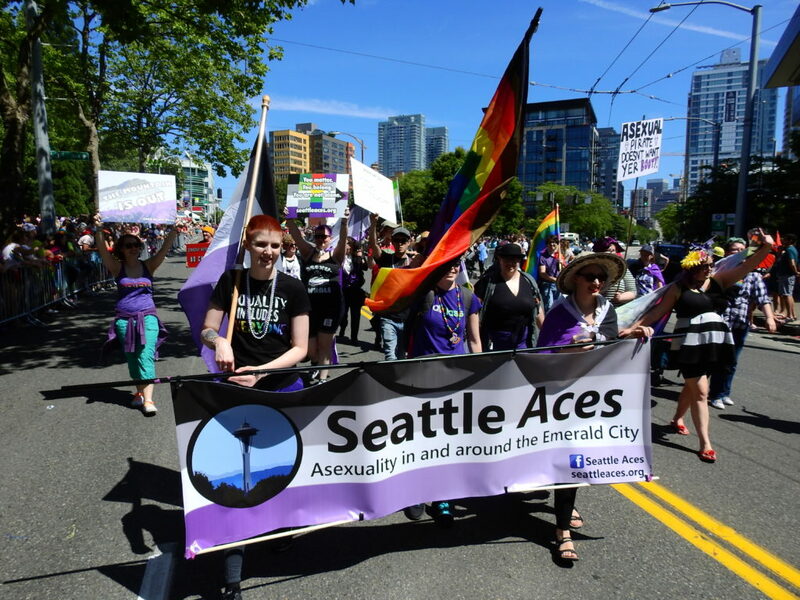 (A)sexual is a 2011 documentary about asexuality, featuring David Jay, founder of AVEN and Julie Sondra Decker, author of The Invisible Orientation, and including Seattle’s own Dan Savage as the film’s main villain. It is available on Netflix and other streaming services, and locally, Three Dollar Bill Cinemas has a copy. It was suggested that we try to tie the screening into the TWIST Festival or Asexual Awareness Week, both of which are in October. Also floated was the possibility of using the screening as a fundraiser for the group (Likely to help raise the entrance fee for marching in the 2017 Pride Parade) and trying to get someone from the film to come to the screening. If we screen the documentary, we’ll probably pair it with a panel discussion afterward, to address some of the problems with the film, as well as to answer any questions that might come up. We also talked about alternative/additional things to feature. I mentioned a new documentary that’s being made by asexual people (The (A)sexual documentary was made about aces, but not by aces), but unfortunately that is not going to be released in time for TWIST/AAW this year. There is also the recent Telus short out of Canada, called Asexual: A Love Story, which features several people who come to our group! Casually bring up asexuality. “Hey, there’s this thing I just learned about… Isn’t that interesting?” Mention that it’s a thing and a brief explanation of what it is. Start posting articles/websites/etc. about asexuality to your social media accounts. But don’t force it on them, don’t say “this is what you are”. It’s not your place to define others. Let them come to their own conclusions. This again shows the importance of visibility. People can discover that they’re gay on their own because the possibility of being gay is common knowledge. It’s more difficult for people to discover that they’re asexual on their own, because people simply don’t know that it exists. Definitions of various ace-related terms came up. I have a glossary here, but it’s old, it’s missing some terms, and some of the definitions it does have are a problem. I’m working on revising that page, and I’ll get some pamphlets printed up when I’m done with that. There are many, many lists of potential and confirmed aces in fiction. We talked about some characters who didn’t get it on. Also mentioned were Bones and The X-Files, both of which had strong platonic relationships between the leads, and both of which were ruined when they were unnaturally forced into a romantic/sexual relationship. 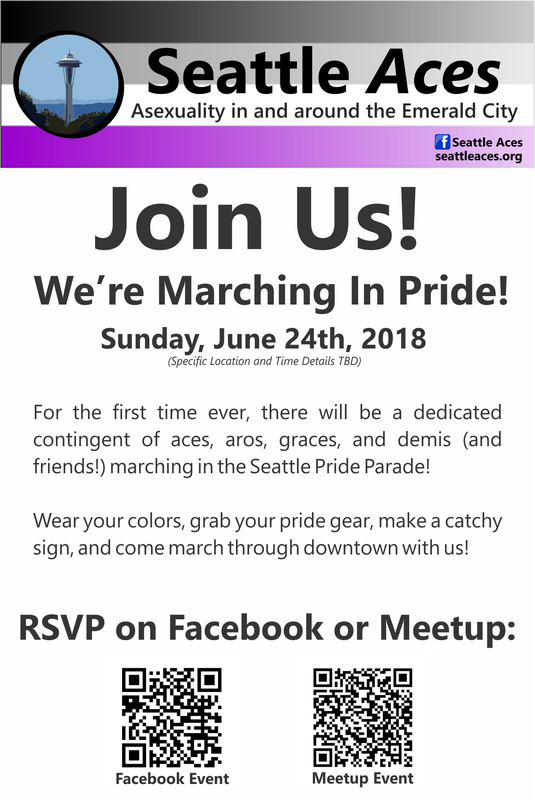 I often hear that Pride can be a lonely place for aces, so let’s get out there and be seen! 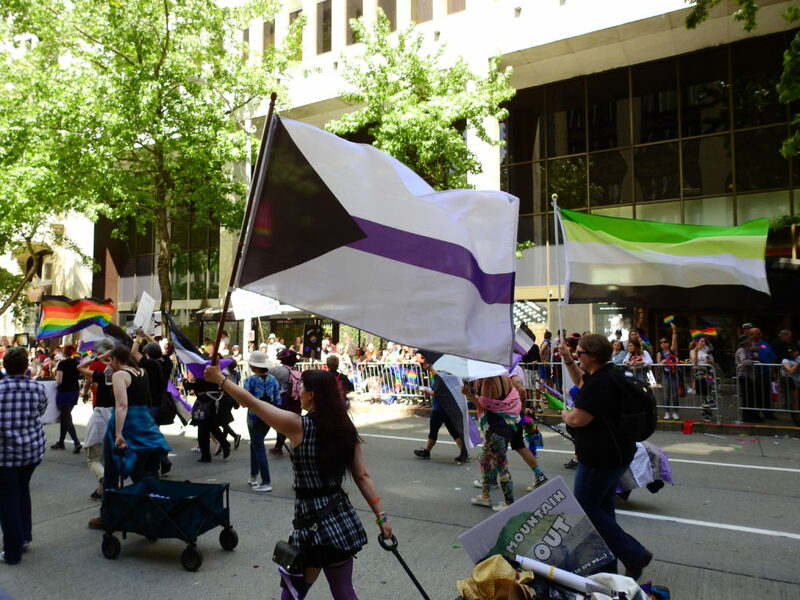 Rainbow Depot sells Asexuality Flags of several different sizes. I’ve been extremely happy with the quality of the flags I’ve bought from there. 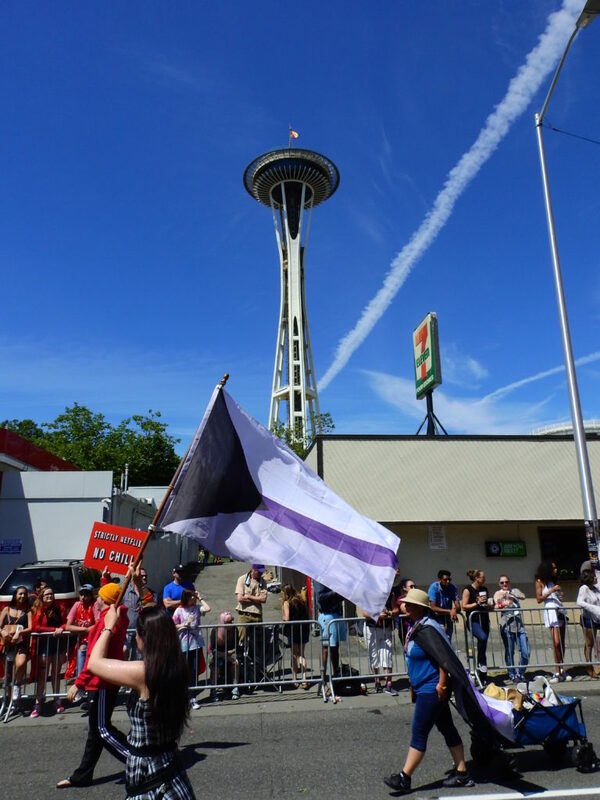 So, pick up a flag or two and wave around our black-gray-white-purple at whatever events you go to and make yourselves seen! WhatIsAsexuality.com has a number of printable cards and pamphlets that would make good event handouts. They even have a little open space that’s just the right size for a sticker or stamp with your group’s contact information! And if you go to a Pride event, take pictures! Post those pictures! Send them here and I’ll put them up on the site. Post them to the Seattle Aces or Northwest Aces Facebook groups. The best way to be visible is to be visible! Show everyone that we exist! Obviously, in Seattle, the big event is the Seattle Pride Parade and PrideFest at Seattle Center. This year, it will be held on Sunday, June 26th. 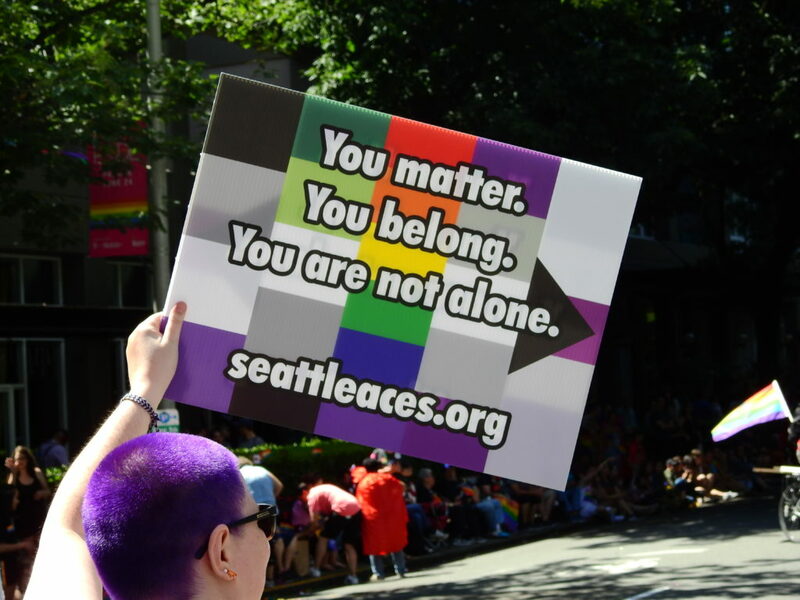 More events throughout the month of June and other information can be found at Seattle Pride. Portland is also throwing a party. 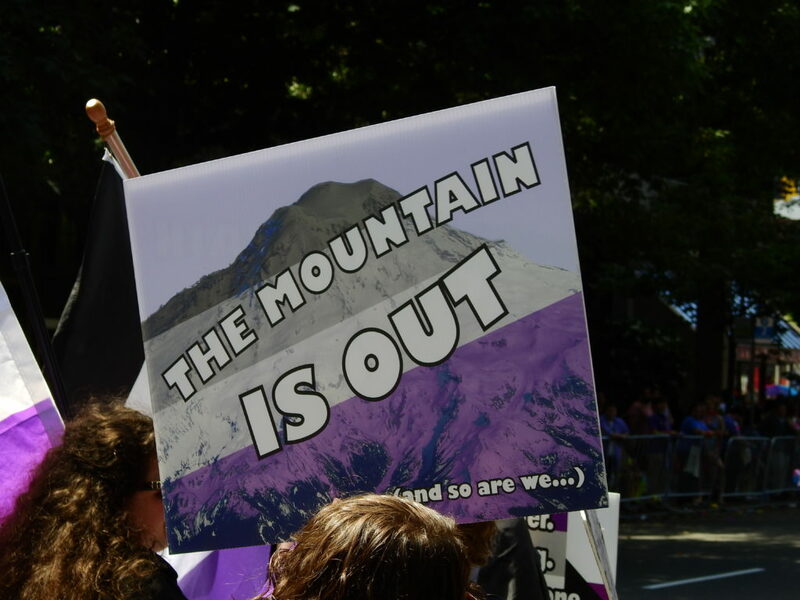 The Portland Pride Parade is on Sunday, June 19th, and the Pride Festival on the Waterfront is both Saturday the 18th and Sunday the 19th. More information and events can be found at Pride Northwest. Vancouver waits until the end of July to keep the fun going through the summer. Their parade and festival are on July 31st. You still have time to get your passport or enhanced driver’s licence to get across the border! 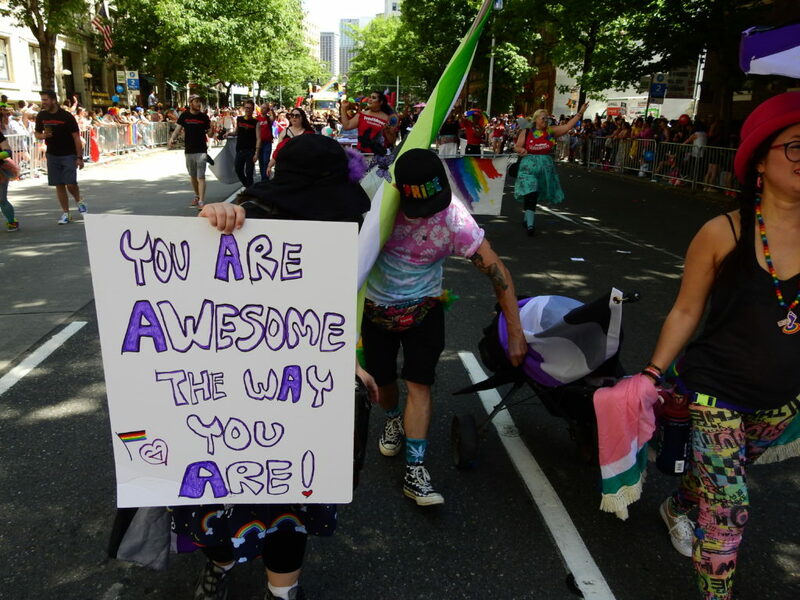 Portland: Pride Parade and Festival are Sunday, June 19th. Details PDX Aces will be attending this event, but not marching. Check out their Meetup group for information. I know of a handful of events where aces will get involved and march in the parade (or have in the past). Please let me know if I missed any events!